A few months back, I approached Brandon about this idea I had for writing a blog on boardgames together. “It’ll be fun,” I told him, “we both love boardgames, we both have strong opinions on them, and it’ll give us an excuse to hang out on a regular basis.” I had other ideas I thought would be cool that I relayed; having friends write guest posts (which is still an option, if you’re reading and want to run an idea by us), showing games turn by turn with recaps as to what we were thinking (if done well, I think this would be awesome with Diplomacy), maybe even starting up a game of Nomic (ok, maybe this is still a bad idea). But really the biggest impetus behind starting this blog was to spend more time with a good friend. See, Brandon and I had done theater together for the past couple of years, but our sketch show got canceled back in April, and the play we were working on together over the summer had a firm end date of July 13th. Sure, we could call each other up and make a plan to hang out, but it wouldn’t be consistent. And what better way to spend time with a person I enjoy spending time with than board games? More recently, Brandon convinced me to signup for Yucata, a website where you can play board games for free (80 different ones, at last count) in a sort of play-by-mail system. Specifically he’s talked about a couple of games he finds especially interesting, A Few Acres of Snow and At the Gates of Loyang and so I signed up. I’m not new to the digitization of board games. I spend a decent amount of time over at Isotropic playing Dominion, and when I have time at a lunch break at work I’ve been known to bang out a game of Stone Age at BoardGameArena.com. Isotropic and BGA are both fast ways to play games that I love for experiences that are… lonely, actually. In fact, the thing that I am most surprised in how different a game feels when playing online versus when played in person, is my level of expertise. 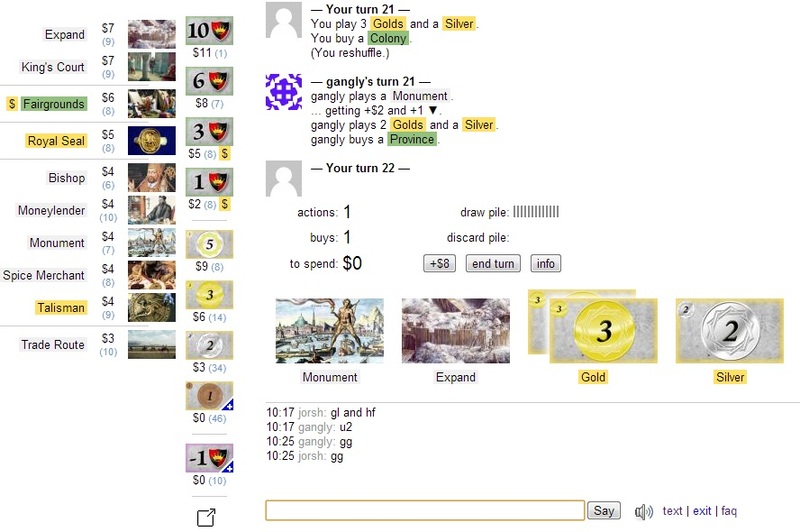 In a game like Dominion, where the game moves much more quickly online than in person (the thing that takes the longest in person is shuffling and reshuffling your deck. Computers do that instantly and that is very nice) and as such some games can be completed in 5 to 10 minutes, I do feel like I’ve gained a certain expertise that would have taken much much longer. The availability of players, at all hours of the day means I’m a much stronger Dominion player (at least, in two player games). Conversely, in games that take longer, the boredom and multitasking kick in and I find myself unengaged, which often results in solid, but not innovative play. I have a certain familiarity with Stone Age, but since I’ve only played it once in person, I don’t think I’m particularly that good at it. A player who is newer to the game probably will have more insights than I will, because I’m used to not paying attention. This problem is even worse on Yucata, where games can take days and you can have multiple games going at once. Keeping long term strategies separate is very difficult if you’re playing multiple games. And evaluating a strategy that you used is then impossible. Playing online can leave you without the social aspect and without the strategic aspect of gaming, but I’m still playing. Brandon and I haven’t started up a game of A Few Acres Of Snow yet, but its pretty cool that we can try it out for free and when we aren’t in the same room to see if we like it. When a friend of mine moved to France he left me some games, and I had seen Stone Age before but had never sat down and played it, so online was a nice way to be introduced to a game that other people in my circle had played some before. I know which Dominion expansions I really like (Seaside, Prosperity, Cornucopia) and the ones I’m not a huge fan of (Alchemy, Hinterlands) even though I don’t own a few of them. And there are certainly worse ways to kill a lunch break.